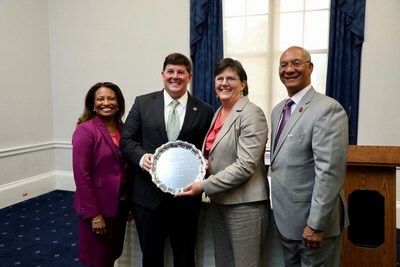 WASHINGTON, April 16, 2019 /PRNewswire/ -- On April 9, The National Association of Housing and Redevelopment Officials (NAHRO) honored Congressman David Price (D-NC) and Congressman Steven Palazzo (R-MS) with the Legislator of the Year award on Capitol Hill. Rep. Price is a longtime member of the Appropriations Transportation-Housing and Urban Development Subcommittee and is its current chairman. He has fought for funding for HUD programs, particularly Public Housing and Choice Neighborhoods. Rep. Palazzo has a first-hand understanding of the unique challenges housing authorities face. A former CFO of the Biloxi Housing Authority, he has fought for legislation to help public housing authorities run their programs more efficiently, particularly small agencies. 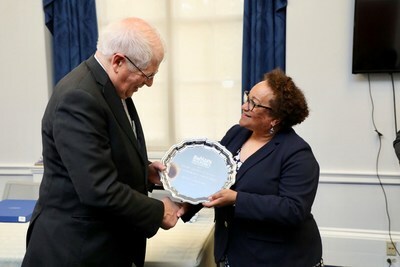 NAHRO's Legislator of the Year Award honors members of Congress who are strong advocates for housing and community development programs and for the NAHRO members who administer them. "NAHRO and its 20,000 members are grateful to Representative Palazzo and Representative Price for their commitment and leadership," said NAHRO CEO Adrianne Todman. "We need leaders and advocates on the Hill who understand the importance of housing and community development programs and the transformative effect they have on communities nationwide."